Do you have a slab leak in your Simi Valley home? Call us today at (323) 745-2839 for more information on the options available to fix your leak right the first time. Many factors may contribute to slab and foundation leaks including age of the property, quality of original workmanship, settling of the foundation, as well as water quality and the pressure at which the water enters your plumbing system from the outside. Our slab leak detection experts are skilled at quickly finding the source of a leak, even when it is not visible to the naked eye. It is critical to address slab leaks immediately because of the potential water damage that may be done, putting the safety of your home’s foundation at risk. If our Simi Valley slab leak repair specialists have a direct access point to fix the leak, it is possible to cut into the concrete and make the repair. 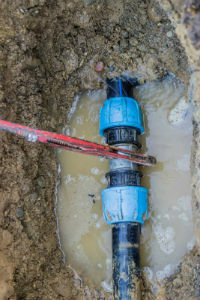 However, usually the most cost-effective solution is to re-route entire sections of pipe outside of the slab to avoid unnecessary damage to your home. Once there is one leak in the slab, others may follow sooner than later. Bypassing the foundation completely via our re-piping service can offer some peace of mind that you will not have to deal with future slab leaks. If you are need of a slab leak repair, Simi Valley residents have trusted us over and over again to get their plumbing system back up and running fast. Call us at (323) 745-2839 to schedule an appointment.